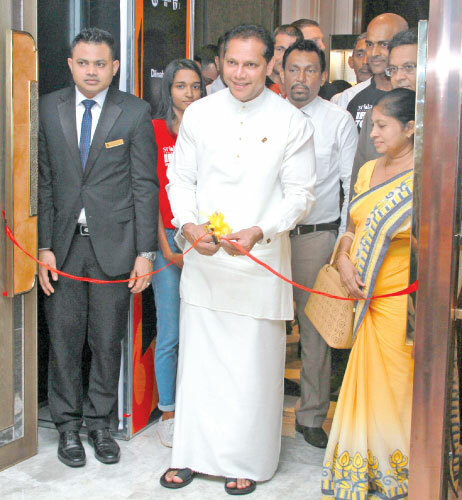 Sports Minister Dayasiri Jayasekera cuts the ribbon to inaugurate Colombo EXPO 2018 at Shangri-La Colombo, Ballroom yesterday. Sri Lanka Wonder of Asia Ironman 70.3 Colombo Triathlon will be held at Galle Face Green, Colombo on Sunday, February 25. A total of 870 participants from 64 countries will take part in the ‘Ironman Triathlon Colombo’ and the event will attract over 3000 local and out-of-town visitors to Colombo. The organisers target to generate a revenue of over US$3 million in direct economic impact to the country during the period of the triathlon. The average age of Ironman participants is 39 years old with the oldest participant being 81 years and the youngest 19. The percentage of male participants in Ironman is 77% and the female participation is 23 percent. Pro Am Serendib marketing portfolio reached more than 30,000 Ironman registrants, many of which often travel to multiple events each year. The competition was marketed as a major tourist attraction for Sri Lanka. On average 81 percent overseas participants are already in town filling most of the city hotels to its capacity for the weekend. Of those who participate, many travel with three to four additional people with them for the support, generating much anticipated tourism boom in the month of February. Ironman 70.3 is one of the most recognised brands in the world, attracting high spending foreign tourists from across the globe. During the Ironman event Sri Lanka will see over 3000 athletes and their families visiting the country. India has 133 triathletes; United Kingdom 76; France 47, Australia 34, USA 30 and Singapore 26. They are the top six participating countries for Ironman 70.3 Colombo. The race begins with a single-loop, 1.9km swim starting at the Indian Ocean adjoining the Galle Face Green, followed by a flat and fast three loop 90km bike course and a 21.1 km run course. “With Sri Lanka diversifying its offering with sporting events of this nature, we aim to provide an energy that helps bring our communities together,” said Deshabandu Julian Bolling, Director Pro Am Serendib. Shangri-La Colombo will host a four-day Expo, showcasing a range of Sri Lankan products and sporting goods. Ironman 7.3 Colombo showcases local products and services to the world to put Sri Lanka on the map in an arena of sports. The Ironman Expo 7.3 Expo 2018 commenced yesterday and will continue till February 25 at the Shangri-La Colombo, Ballroom. It will be the meeting point of 880 athletes, well-wishers and spectators while it will house the registration, message boards and presentations for the grand event. Entrance to the Ironman Expo 7.3 Expo 2018 will be free to all including the general public. Ironman 70.3 Colombo is organized by Pro Am Serendib, made possible by the title sponsor Sri Lanka Tourism Promotions Bureau and co-sponsors.